Home » Crazy Kids » Happy Halloween!! 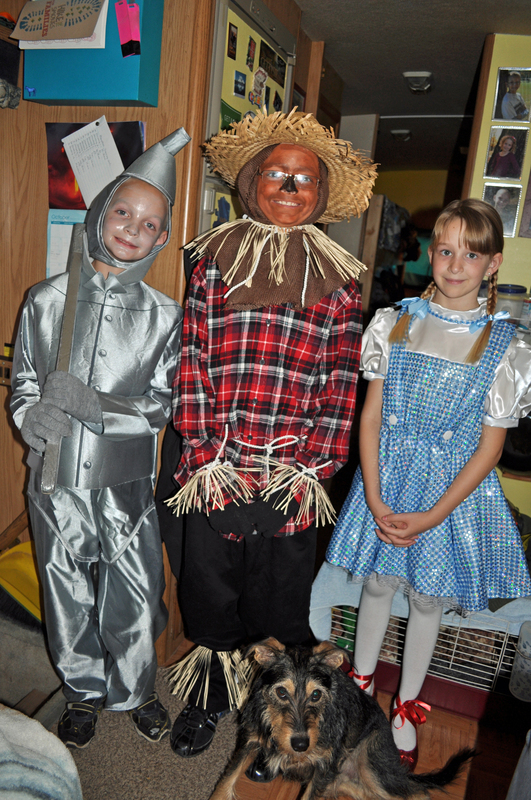 This entry was posted in Crazy Kids, Daily Life, Family Adventures, Kentucky, Random Thoughts, RV Life, Travel and tagged halloween, Kentucky, RV life, travel, Wizard of Oz. Bookmark the permalink. Great costumes…cute as can be! Here’s Mom! Sorry I’ve been so busy lately. Hopefully there will be a lull now and I can visit more often. The kids are so cute in their costumes and are growing up so fast. Looks like Toto, I mean Charlie, had fun, too. He really does look like Toto! Hope you enjoyed your treats from them. Sorry you had to miss the fun. 😦 We love and miss you all so much! They are growing up very fast, and getting very tall! They have decided they want to be something scary next year, so we will have to see what they come up with. We love and miss you, too!! !